The Royal Navy’s head has defended the actions of 15 British personnel seized by Iran and UK operations in the Gulf.First Sea Lord Admiral Sir Jonathon Band said the crew “reacted extremely well in very difficult circumstances”. 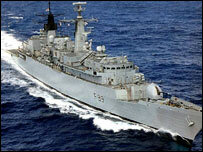 Admiral Band also said British boarding operations being carried out in the Gulf had been sanctioned by the UN. Six of the 15 personnel, who returned to the UK on Thursday 13 days after being captured in the northern Gulf, will speak to the press at 1500 BST. Iran claimed they had strayed into its waters, which the UK denied. Admiral Band told BBC Radio 4’s Today programme: “This incident was a most extraordinary act conducted in those waters. He added: “The boarding operations taking place that morning in the northern Gulf were sanctioned by the United Nations under specific resolutions. Admiral Band said UK boarding operations had stopped for the time being but coalition operations were continuing under British command. The MoD said the UK would continue to ask Iran to return its two captured boats used by the 15 sailors and marines, but he held out little hope of success. 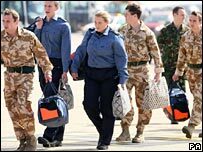 The freed personnel were helicoptered to the Royal Marine base at Chivenor in north Devon on Thursday, after arriving on a British Airways plane at Heathrow in London. Earlier, they spoke of their happiness at being back in the UK and reunited with relatives. Lt Felix Carman said the group had been “completely overwhelmed” by the goodwill they had received when they arrived back at Chivenor. Several said they had been well treated while in Iran, but since their return there have been suggestions some may have been held in solitary confinement. Lt Col Andy Price, who met the group at the airport, said there had been “times when they were left alone”, but refused to go into further detail. The MoD said the freed personnel had roast chicken and roast beef before enjoying drinks with their loved ones on Thursday. The navy has begun a review of the circumstances leading to the capture of the personnel. Rules of engagement, equipment and procedures will all be analysed, the MoD said. In a press conference outside Downing Street, Tony Blair said he was “glad” the crew had been returned “safe and unharmed”. He said “no deal” had been done with the Iranians to secure their release, despite claims by Iran that it received a written apology from Britain on Tuesday. And he contrasted the safe return of the Britons with four soldiers killed in Basra in Iraq on the same day. The US welcomed Iran’s decision to free the servicemen, but said the positive move would not ease tensions over its nuclear programme. It emerged on Thursday that in a television interview recorded before their capture, Capt Chris Air, had said one purpose of patrols in the area was to gather intelligence on “any sort of Iranian activity”.